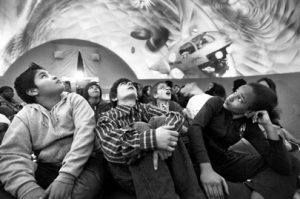 We are so excited to have the Dome Theater, a mobile planetarium, visit CCE on February 13, 14 and 15! Thanks to the generous contributions of friends and family during our FUNd Run, students will now have the opportunity to enhance their curriculum through interactive exploration. Each grade level has chosen a program that is age appropriate and will enjoy a 30 minute show during Planetarium Days! ​Plus, we've added a special night for our wonderful CCE parents to explore the planetarium as well! Please join us for a Family Night on Wednesday, February 14 as we show 4 different productions (approximately 20 -30 minutes) in the Dome Theater for students, friends and parents. ​This is a FREE event; however, we have limited space and FREE tickets are required. Sign up below for your favorite show! ​4:30 - 5:00 - Earth's Wild Ride - Experience a heart-pounding ride though Earth’s wild history from the eyes of a hypothetical future lunar colony! ​5:00 - 5:30 - Fantasy Worlds - Travel past the limits of your imagination! Explore the visual art of extra-solar planets & their radiant sunsets! ​5:30 - 6:00 - Cosmic Collisions - Explore cosmic collisions! Hypersonic impacts that drive the dynamic and continuing evolution of the universe! ​6:00 - 6:30 - Force Five - ​Extreme weather takes center stage revealing images not seen by the naked eye due to their life-threatening nature. Join us for Family Night at The Planetarium. Choose a show and we'll see you there!